An international team of astronomers using CSIRO’s Parkes radio telescope in eastern Australia has found a new kind of cosmic object. An international team of astronomers using CSIRO’s Parkes radio telescope in eastern Australia has found a new kind of cosmic object — small, compressed ‘neutron stars’ that show no activity most of the time but once in a while spit out a single burst of radio waves. The discovery will be published in this week’s issue of the journal Nature. 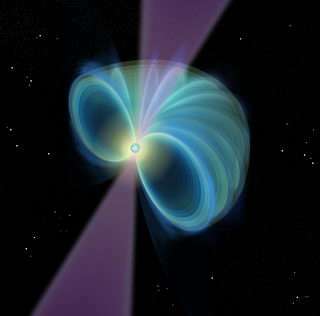 The new objects — dubbed Rotating Radio Transients or RRATs — are likely to be related to conventional radio pulsars (small stars that emit regular pulses of radio waves, up to hundreds of times a second). But the new objects probably far outnumber their old cousins, the scientists say. Eleven RRATs have been found, first detected by the Parkes Multibeam Pulsar Survey and then observed again several times. Their isolated bursts last for between two and 30 milliseconds. In between, for times ranging from four minutes to three hours, they are silent. By analysing the burst arrival times, the astronomers have found that 10 of the 11 sources have underlying periods of between 0.4 seconds and seven seconds. It is this that suggests that they are rotating neutron stars. Because RRATs are ‘silent’ most of the time, the chance of being able to detect one is low. Many more must lurk unseen in our Galaxy, the astronomers argue — perhaps a few hundred thousand. The number of ‘normal’ radio pulsars in our Galaxy is estimated to be about 100,000. Unlike some other kinds of stars that show periodic eruptions, the RRATs show no evidence for being in binary systems (that is, each orbiting another star). A handful of ‘normal’ pulsars produce the occasional ‘giant’ pulse, along with their usual train of regular, smaller pulses. The RRATs appear to differ from these by having magnetic field strengths in the emission region about a hundred thousand times weaker. The research team was drawn from institutions in the UK, USA, Australia, Canada and Italy.